Who would not love adobo? Be it pork or chicken ( which is the common meat ) almost all pinoys love it. What's not to love? Its easy but when you prepare it you can be sure its a crowd pleaser. Yet in the Philippines, there are a lot of versions of this dish. 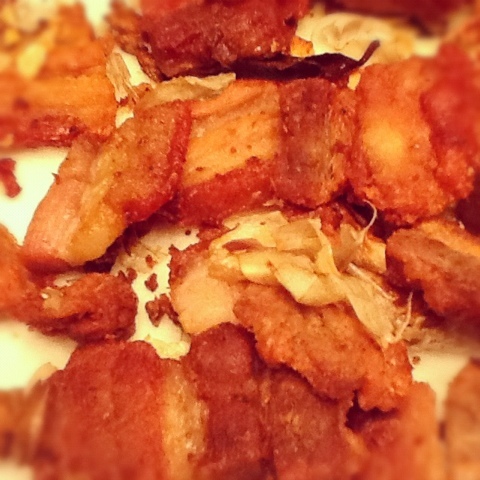 Growing up my definition of adobo was pork sides (thicker cuts of pork belly cut into chunks like the ones used for bacon) deep fried to golden brown. It was tender but the skin ( which is the star of the meat, in my opinion ) is crispy. My grandfather sold this in his carinderia ( eatery ) and thus I always connect the word adobo to his dish. But it was just later on that i discovered that adobo was to some typically meant meat, seasoned with soy sauce, vinegar, garlic, bay leaf and pepper corns. Then simmered until the meat is tender and usually would render fat, then would help brown the meat towards the end of the cooking process. But there is no absolute rule to make adobo, some like it dry and some like the reduced liquid to remain at the end. And this also makes the perfect topping to your rice. Some even add coconut milk or cream to their dish which i have not tried. So which one is my favorite? I would say it depends, just like any dish I have tried that are good and some just didn't cut it for me. But this version I will share is the one i have discovered lately and is my current fave. Add all ingredients( except the garlic ) in a bowl or in a frying pan. Pour in water just enough to cover your meat. Cover and cook until meat is tender and thoroughly done. Remove the lid to let the water evaporate and meat will render fat. Once your meat is brown, add the garlic. If there's not enough oil you can add another tablespoon. Cook until desired crispiness or once golden brown. I prefer the pork skin and garlic to be crispy at the end. Enjoy! you should really post more...love all your dishes! You should really post more of your dishes, love them all!